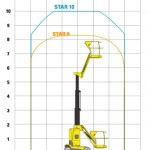 Haulotte Star 10 is a vertical mast boom is the ideal platform for difficult- to-reach places. Haulotte mast boom climbs directly to a working height of 6 to 12m (low range of rotation). 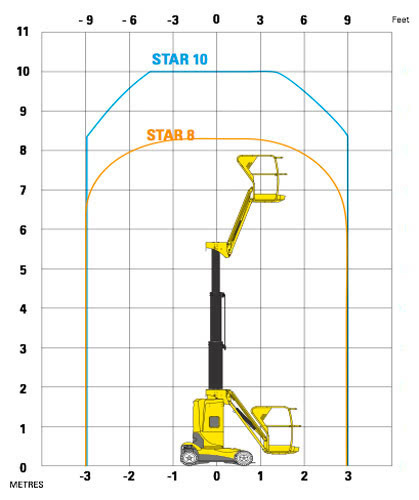 Intended mainly for maintenance work and warehouse inventories, our vertical mast boom can be used both outdoors and indoors, where its white tyres do not leave marks and respect all types of floor surface. Narrow turning radius for better accessibility. Increased safety with 3° slope sensor and pot hole protection. 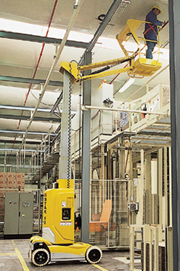 The positive/negative jib offers more flexibility throughout the working envelope. 2.8 mph (4.5 km/h) travel speed. Low total weight for easier transport and more applications. Ergonomic and spacious platform design. Robust, reliable and easy to maintain.